‘Tis the season to indulge in sweets and holidays treats. The holidays aren’t just a time for decorating and celebrating. For many of us, this time of year is also marked by festive treats. In fact, Americans are known for packing on the pounds during the holidays with sweets like eggnog, pumpkin pie, and candy canes. Unfortunately, your waistline isn’t the only aspect of your health affected by holiday treats. Your dental health can also endure quite a bit of damage due to the sweets we typically enjoy this time of year. So, what holiday treats cause the most problems for your smile? Dr. Richard Grubb explains the worst treats for dental health and what teeth-friendly alternatives you should opt for instead. Eggnog is known as a quintessential holiday beverage. It also happens to be packed with fats and sugars that contribute to tooth decay and holiday weight gain. On average, eggnog will have around 20 grams of added sugars that bacteria will feed on. Since eggnog is also a thicker texture, it’s likely to linger in the mouth, which then allows sugar to cause more damage to your oral health. If you add liquor to your eggnog, you’re in even bigger trouble because alcohol tends to dry out the mouth. Without the neutralizing power of saliva, your teeth are at a higher risk for decay and enamel erosion. These red and white striped candies are very popular for the holidays. Whether eat your candy canes or use them as a stir stick for your hot chocolate, this candy is pure sugar and can severely harm your teeth. Candy canes are particularly dangerous because if you chew on them, they can easily get stuck in between your teeth. On the other hand, sucking on candy canes will only expose your teeth to sugar for a longer period of time. Peanut brittle is a treat that many of us like to enjoy or give to others as a holiday gift. Unfortunately, this holiday snack is also very dangerous for dental health. Since peanut brittle is filled with sugar, bacteria present in the mouth will use it to create an acid that contributes to tooth decay. On top of the high sugar content, peanut brittle can also tend to get stuck in between the teeth or to the back molars. It is also a hard, crunchy snack that can put extra pressure on your teeth and cause damaged fillings, cracks or fractures. Fruit cake is a treat that many of us love to hate. 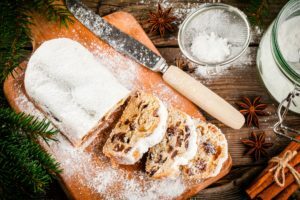 For those who love fruitcake, be aware of the oral risks this treat can cause. In addition to the sugary cake mix, fruitcake also includes sticky candied fruit baked in. The dried fruit can get stuck to the teeth and cause havoc. Remember, the longer your teeth are exposed to sugar, the more damage can occur. We understand that avoiding these treats altogether may be an unrealistic recommendation. Instead, there are a few extra steps that patients can take to minimize the damage that can occur to their dental health. Cheese Platter: Cheese is a great snacking option because it helps to lower pH levels in your mouth. Neutralizing acids in the mouth is crucial for avoiding erosion of the protective enamel layer. Crunchy Veggies: Snacking on crunchy veggies is also a great option because it promotes saliva production, which is another great tool for neutralizing acids in the mouth. Additionally, crunching on veggies help to disrupt plaque accumulation on the teeth. Sugar-Free Gum: Chewing sugar-free gum is another great way to promote saliva production, which helps neutralize acids and wash away food debris. Don’t wait until the new year to start caring for your smile! Small changes made today can help set you up for a beautiful healthy smile in 2017. Ready to get started on proper dental care? Contact our office in Havre de Grace to schedule your appointment today. Here at Family Implant & Reconstructive Dentistry, we offer a range of services to care for your smile. Call (410) 939-5800 to schedule your appointment today!